Thad Roberts, a fellow in a prestigious NASA program had an idea—a romantic, albeit crazy, idea. He wanted to give his girlfriend the moon. Literally. Thad convinced his girlfriend and another female accomplice, both NASA interns, to break into an impregnable laboratory at NASA—past security checkpoints, an electronically locked door with cipher security codes, and camera-lined hallways—and help him steal the most precious objects in the world: the moon rocks. But what does one do with an item so valuable that it’s illegal even to own? And was Thad Roberts—undeniably gifted, picked for one of the most competitive scientific posts imaginable, a possible astronaut—really what he seemed? 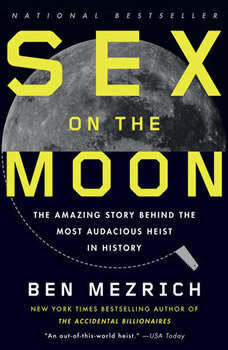 Mezrich has pored over thousands of pages of court records, FBI transcripts, and NASA documents and has interviewed most of the participants in the crime to reconstruct this Ocean’s Eleven–style heist, a madcap story of genius, love, and duplicity that reads like a Hollywood thrill ride. Reminiscent of Wiseguy, Mob Boss is a compelling biography from two prominent mob experts recounting the life and times of the first acting boss of an American Mafia family to turn government witness.